I love her. 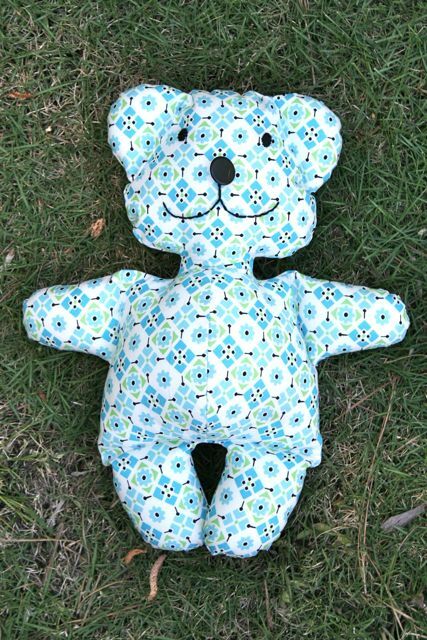 And, as luck would have it, tomorrow our youngest needs to have a teddy bear to take with her to school, so I get to look like the coolest mom in the whole class (for once) and send her in with this lovely, handmade one! Woot! I don’t know what it is about the shape that appeals to me so much–probably the pudgie little belly that does it, really. Or the way the arms stick straight out on both of them–so cute! And one of the mysteries of the sewing universe: how can such a simple face, so easily embroidered with the most basic stitches, be so evocative and have so much personality? Isn’t that funny? The actual vintage one, on the bottom, was even embroidered with simple thread–not even floss! I used six strands of floss for the new vintage-look one, on top, and neglected the oval face (d’oh! ), and still it’s just as sweet as can be. 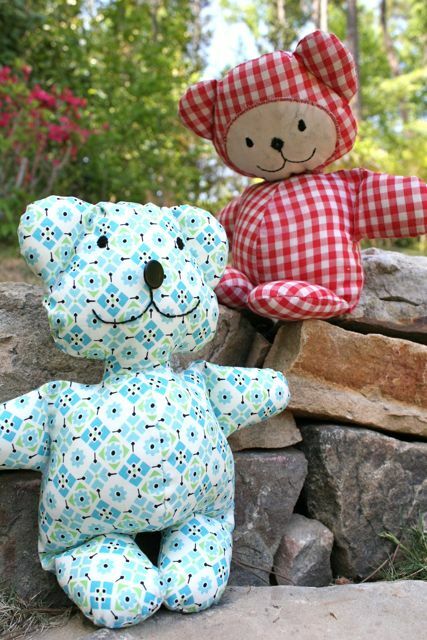 Before I made this version, I made a prototype to test out the pattern I’d sketched based on my own, vintage bear. I wanted to draw a new pattern that was as similar to the original in all my favorite ways as I could, but that would take on its own attitude. The kids STOLE the prototype, no lie, and I couldn’t get it from their sleeping clutches. How’s that for a hit bear? So I kept this version under wraps until I could at least get some pictures of it! 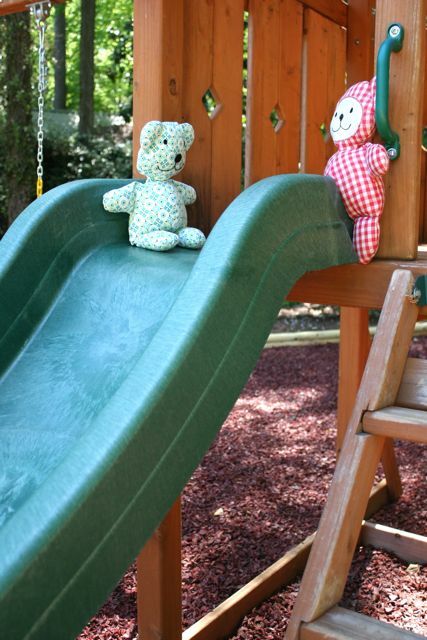 We went out in the yard today and let the bears play. They don’t really stand up or pose very well, so some of the little scenarios I had in my head didn’t quite play out, but for soft floppy toys, they sure do some cute stuff. I can only imagine what the children will have them doing in short time. I would never have predicted that I would get so excited about seeing my kids so excited about something I sewed–but man, that’s one of the best parts of owning a sewing machine, if you ask me. I’m working on putting this pattern into PDF format to share with you all, along with a nice step-by-step, if you’re interested? This was a quick, simple sewing project that took around 45 minutes, including stuffing and hand sewing. 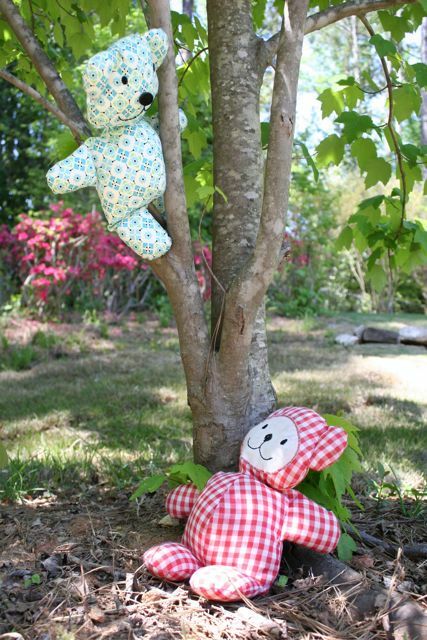 Would make a really swell baby gift or way to burn some summer daylight and keep the kids occupied when they’re not in school! I think I might have to play with the zoom on my printer, too, and make some of these in other sizes. Good grief, they’re funny and sweet! 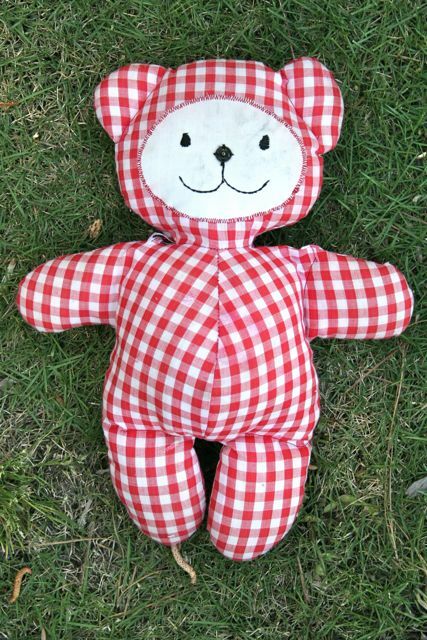 I love those classic toys–who needs some horrible Bratz doll when you can have a teddy who’s happy to see you, am I right? ← Micro Mod His and Hers Sew-Along: A Grand Day Out! Aw, they are so cute! My mom isn’t the crafting type, so I rarely got handmade toys. 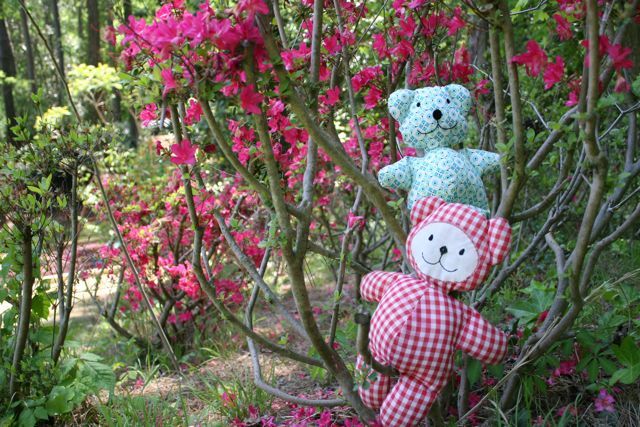 My grandmother is the one who always sent us lovely handmade things, and I had some doll clothes that were tatted by one of my aunts. Those were always the things I treasured most. Thank you for sharing your treasure! I miss the days when toys were made to make you smile, not just make you buy more crap from their “line”. 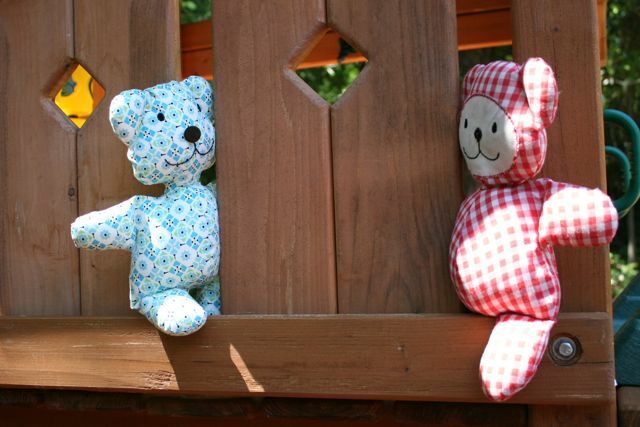 The bears are adorable, I will be eagerly awaiting word on a pattern! Thanks! 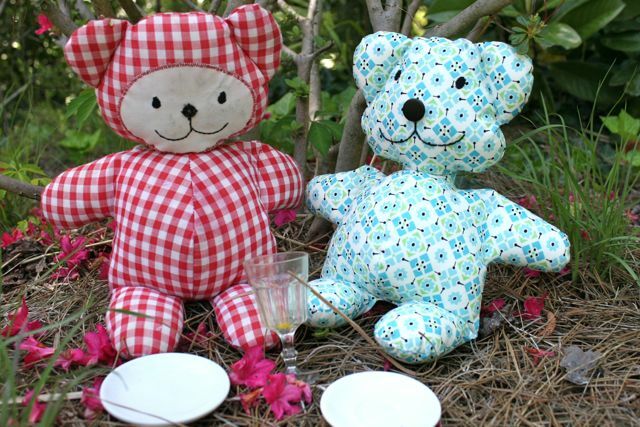 The bears were actually from a McCall’s pattern and I was obsessed by them. I used valuable minutes of an INTERNATIONAL phone call (outrageously expensive in 1974) to ask my mom to buy the pattern and send to me. I made the family for you and your sister for Christmas – you were three months old. The internet is amazing. I am now at least as obsessed with this pattern as you were 35+ years ago! Aww, love the new mummy and daddy. Oh, and that your mummy told you where they were from too! I have a teddy bear (Timothy!) that I got in Germany when I was born! 55+ years ago, but who’s counting? He is the same size as yours and has the same stick out arms and everything! He is kind of fuzzy, but not like what you see today. And he is stuffed with what looks like grey wool. He had button eyes at one time that fell off and I sewed him new ones when I was not even in school yet. They are still working for him! I used to make him all different kinds of ties and vests to wear…none of which survived all our moves. I’m glad that I still have him and thanks for the memories you stirred up! What a great project, Deborah! They are both so sweet and I love how much your kids are enjoying them already. Here here to no Bratz!